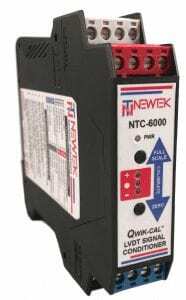 The NTC-6000 Qwik-Cal ™ LVDT Signal Conditioner from NewTek Sensor Solutions provides an intuitive AC-LVDT setup process. Calibration is accomplished with front panel null indicators and pushbuttons to set Zero and Full Scale output positions. The NTC-6000 offers a choice of excitation frequencies, multiple analog output types, accepts a wide dynamic range of LVDT outputs, indicates LVDT connection failures, and incorporates a 2-wire RS-485 digital communications port. 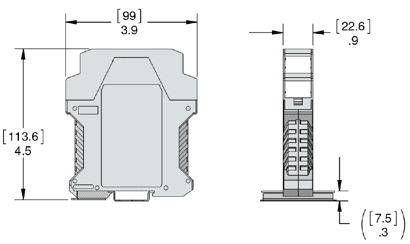 Along with color-coded plug-in screw terminal connectors and a 2 year warranty, these are just a few of the many advanced features that make NewTek Sensor Solutions NTC-6000 module an extremely versatile smart LVDT signal conditioner. fails, new master is automatically generated for fail-safe excitation.